Join the discussion on our forums! 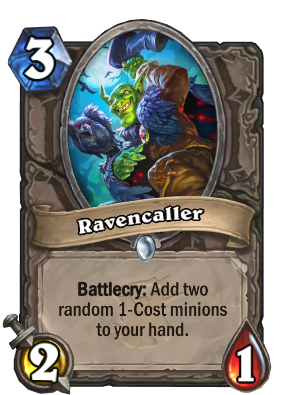 Come discuss Ravencaller over in our dedicated Ravencaller discussion topic. That Friends and Familiars Plan is really paying off! Quest and "Odd Cost" Hunter Approves! Very cool card! The good news is theres a lot of odd hunter synergy. This, Tol'vir Warden, and The Marsh Queen are all odd. Baku decks love inflated 1-drop numbers to fill the early curve (1 drop, heropower, then 3drop or 1drop-HP) AND you get Clockwork Automaton for a little surprise burst. With Baku hunter hero power deals 3 damage and with Clockwork it will deal 6 so he is quite right to treat it like a "suprise". Not a pleasant one though. If they don't clear it next turn its gonna be 6 damage from the creature. If it eats a removal thats ok, and if the deck doesn't hold board control... A) something clearly went wrong. And B) it still trades. You mean 7 Mana 4/4 deal 6 Damage to Enemy Hero ? Have you met Blazecaller ? Reload for Quest Hunter??? They are getting a bit of help with this expansion and the 1 drop synergy. Also a possible card for Aggro/Token Druid if they get a couple new buffs. Meh... Arena card... Still pretty mediocre in arena. isn't meant to be play on curve, probably during mid game for zoo-like or aggro deck. Also a nice addition for Odd deck, since the deck will need a lot of 1-cost cards to fully utilize mana per turn. hand druid? i dont know seems like dust to me. bad stats with RNG based effect. most of the ppl dont even know that Shrieking Shroom exist, this card is very similar. 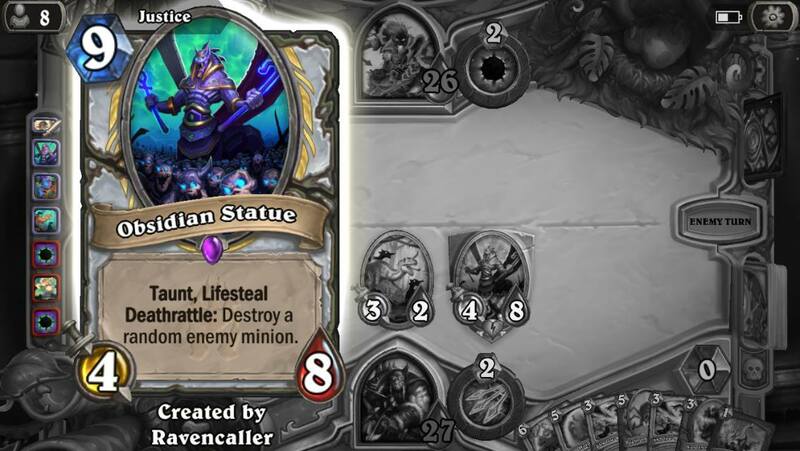 I get the hype about quest hunter but y'all realize that quest hunter's weakness is that it's a deck filled with 1 drops and a big minion that will be insta killed by removals right?